Cooking with kids can be a lot of fun … and a big headache when it comes to cleaning up. What if you could make a cupcake with your kids that didn’t require turning your kitchen into a disaster zone? 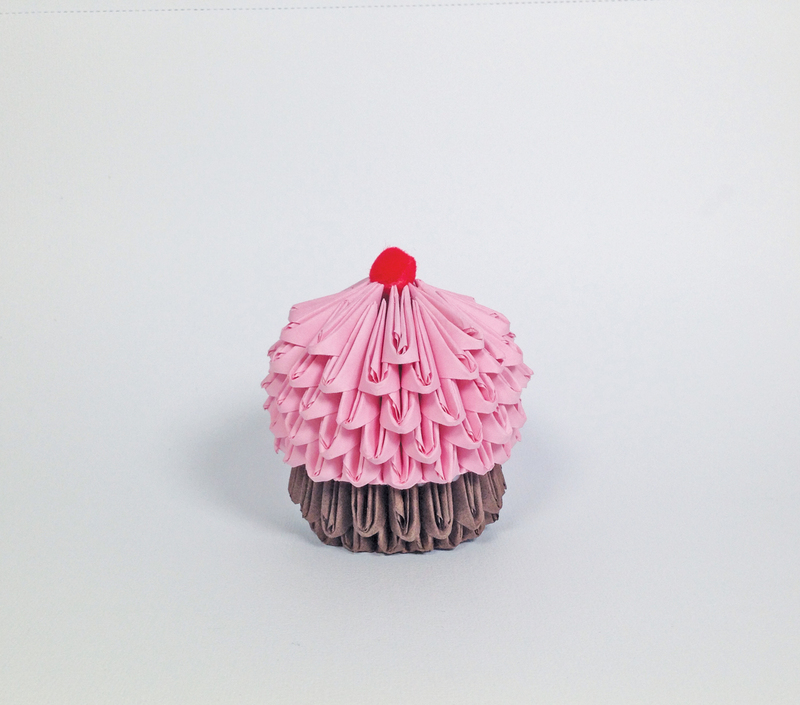 Enter origami cupcakes, aka the kind of dessert every mom can get behind. 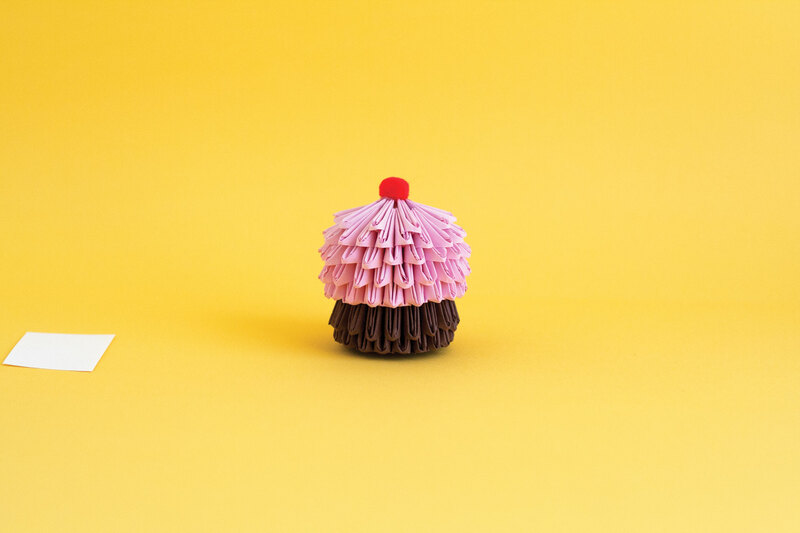 Crafty mom Stephanie Martyn is an origami master who’s created a ton of mess-free “recipes” for origami crafts kids will love, from cupcakes to butterflies to sea turtles. 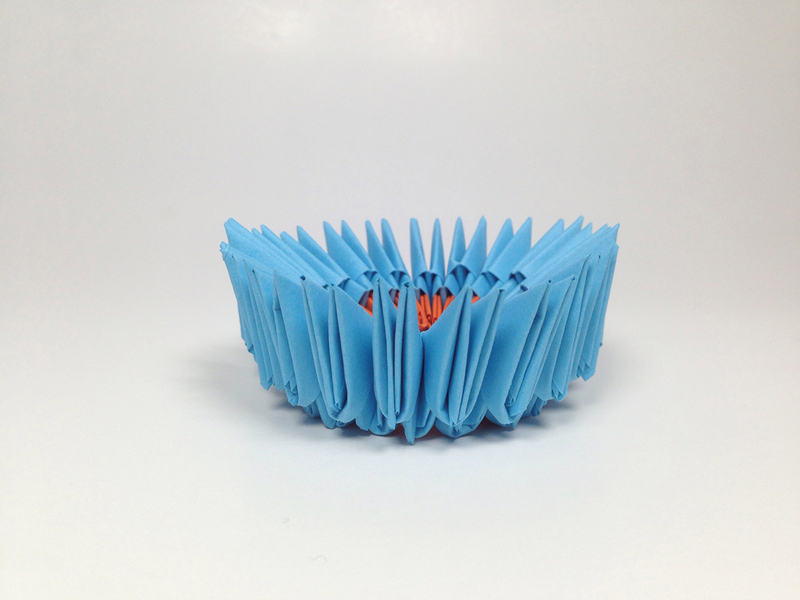 She offered SheKnows a sneak peek at how to make one of the coolest crafts in her new book, 3D Origami Fun! : a chocolate cupcake with pink icing and a cherry on top. 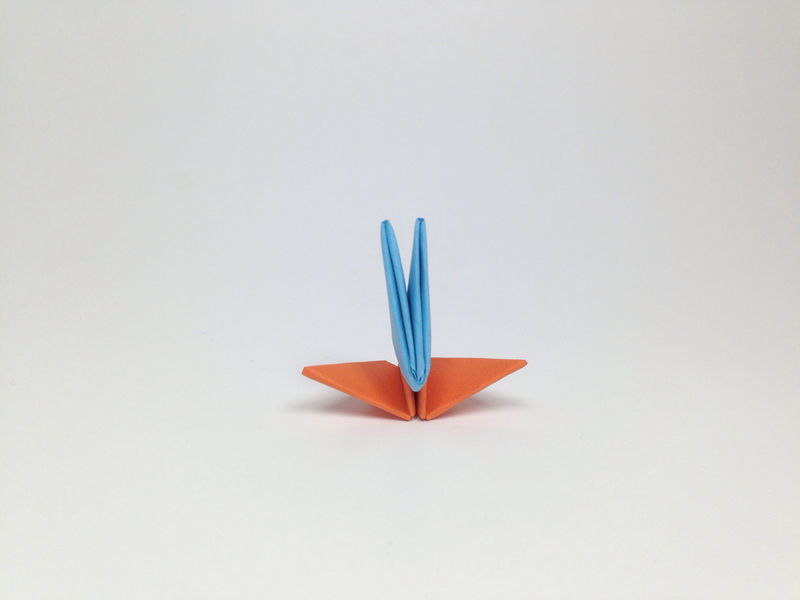 The following is excerpted from 3D Origami Fun! 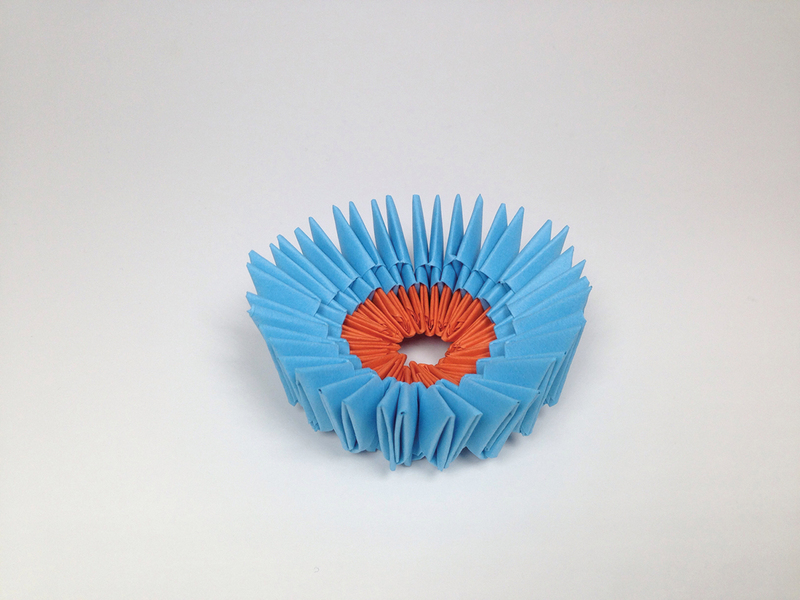 : 25 Fantastic, Foldable Paper Projects by Stephanie Martyn. Copyright © F+W. Used by permission of the publisher. All rights reserved. Photography by Stephanie Martyn and Elisabeth Lariviere. 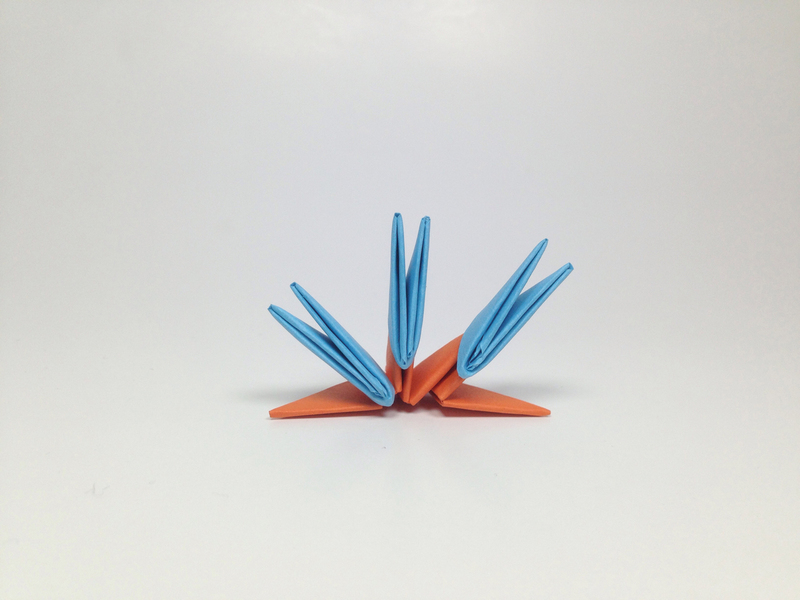 The secret to a sturdy 3-D origami structure is having a solid base. 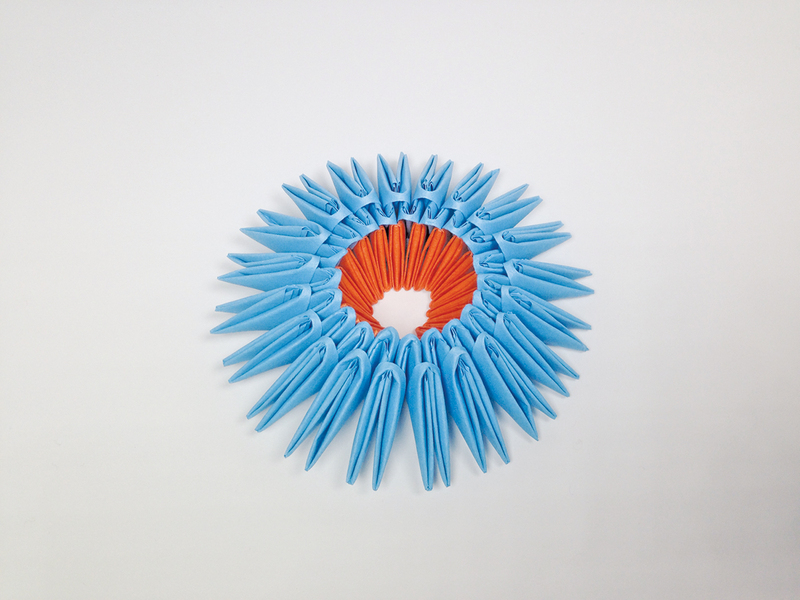 It may take some time getting used to manipulating the small folded pieces to fit into each other’s pockets and points, but with practice and persistence, this process will become second nature. It is important to glue your base as you construct it. 3-D origami structures start off fragile in the beginning, but you will notice that as you continue building, the structure becomes amazingly sturdy. The number of pieces that go into a base depends on the specific design. This one uses 20 pieces in each row. Technically, only the orange pieces make up the base, but it’s necessary to have the blue pieces (row 1) to hold the base together. To keep things simple, we’ll consider row 1 as part of the base. Thus, two rows of paper make up the base. Refer to the diagram or instructions for each specific project for further information. 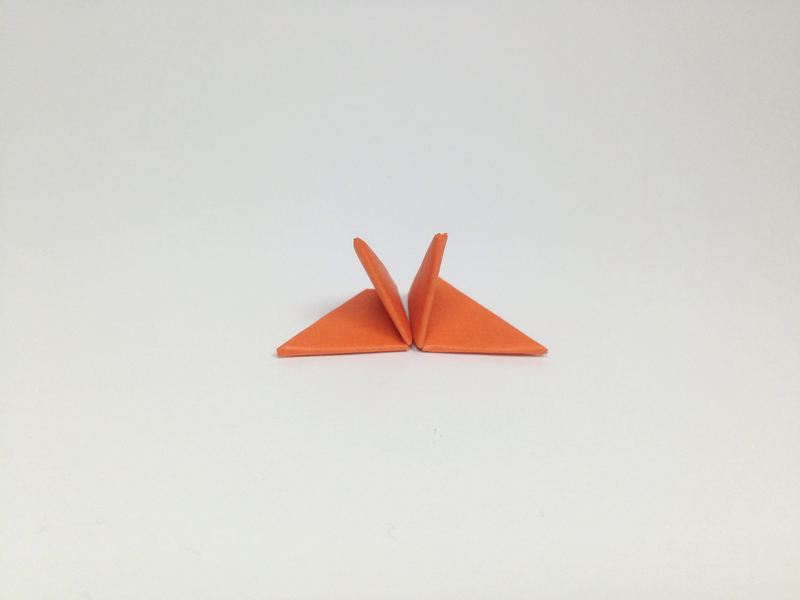 Hold two folded Size A origami pieces next to each other with their points facing up and smooth sides facing you. These orange pieces represent the foundation of the base. These pieces will not be visible in most structures. You will now add a piece to row 1 of your structure. This is represented by the blue piece. Use your finger to wedge open the bottom pockets of the blue piece. This will make it much easier to insert the orange points. Now place a dab of glue between the points of the orange piece, where your orange and blue pieces will connect. Face the blue piece in the opposite direction (rough side toward you) and insert the orange points into the blue pockets. Push the blue piece as far down as you can. 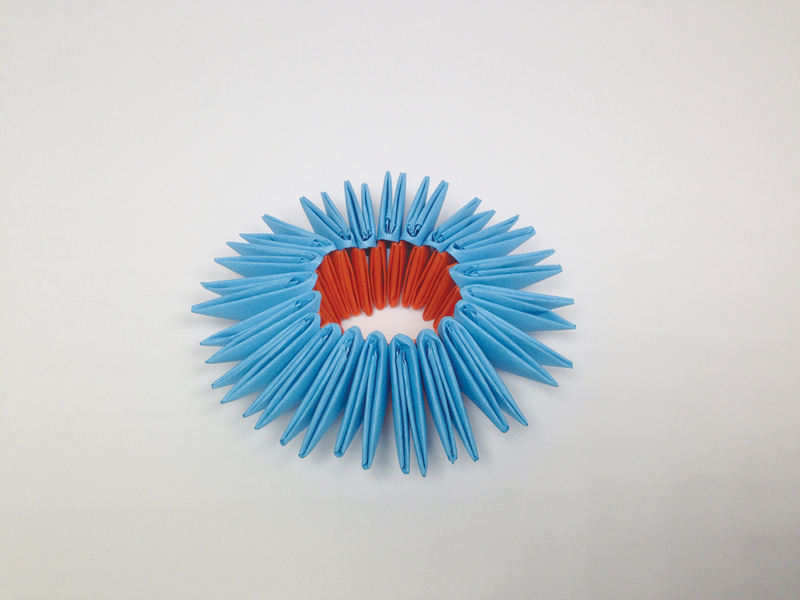 Add two more orange pieces on both sides of your working circle. Glue two more blue pieces onto the points of the orange piece. Continue repeating step 3. Don’t forget to add glue during these crucial steps; it will keep your base from slipping apart. 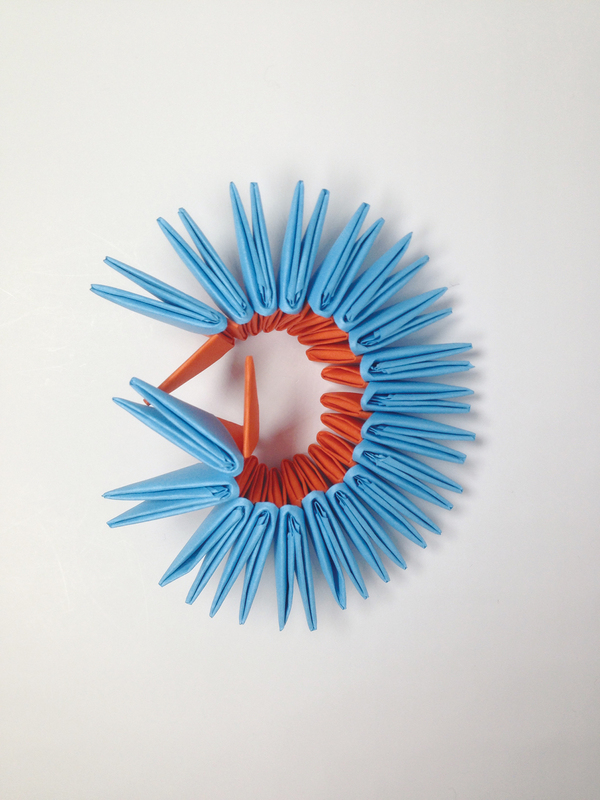 Once you reach the amount of pieces you need in a row for your base (orange), join both sides with a final piece (blue) to connect the circle. Row 2 should have the same amount of pieces as your base and row 1 (unless your design tells you to increase/decrease). The base will start to shape itself as you work your way up and add more rows. You can help it along by shaping it so that you create a flat bottom (orange pieces). This can be done by scrunching the blue pieces together so their points are facing down. As you do this, you’ll see the pockets of the orange pieces rise in the middle. The pocket edge of the orange pieces makes up the flat bottom. Now flip it over so the orange part is on the bottom and the blue pieces are pointing upward. Your base is complete! Build upward from this while following your project’s colored diagram and see a work of art form before your eyes. Substitute the brown with yellow or tan to get a vanilla cake. Perhaps change your frosting to a different color and top it off with a blue pom-pom instead. The possibilities are endless! 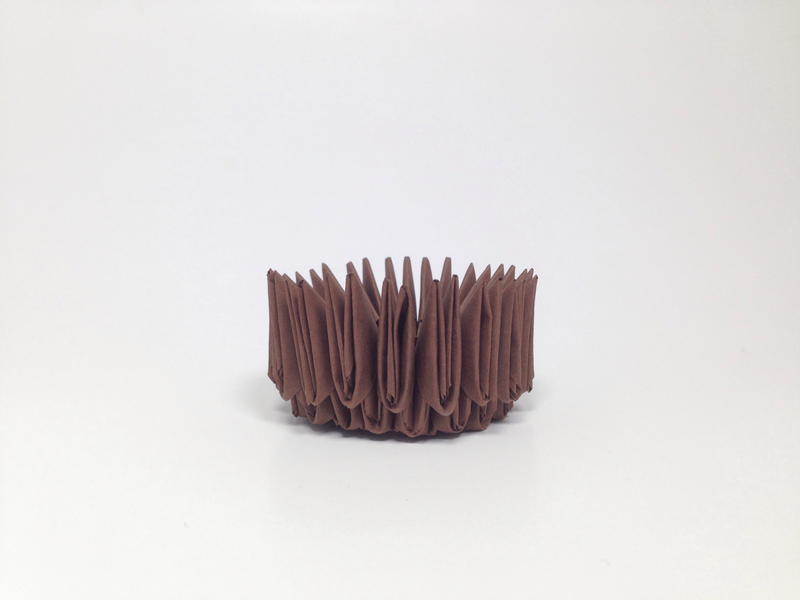 Start the cupcake with a basic 3-D origami base. There will be 18 brown pieces in the foundation row (shown in orange above) and 18 brown pieces in row 1 (shown in blue above). Complete the cake portion of the cupcake with one more row of brown pieces. Each folded piece added to a new row should join two pieces from the previous. Glue as you go. In the next row, pink pieces will be inserted, smooth side facing out. This row will not really be visible when your structure is complete because it serves as a foundation to “restart” your base. The purpose is to create a bump in your structure to differentiate the cake from the frosting. 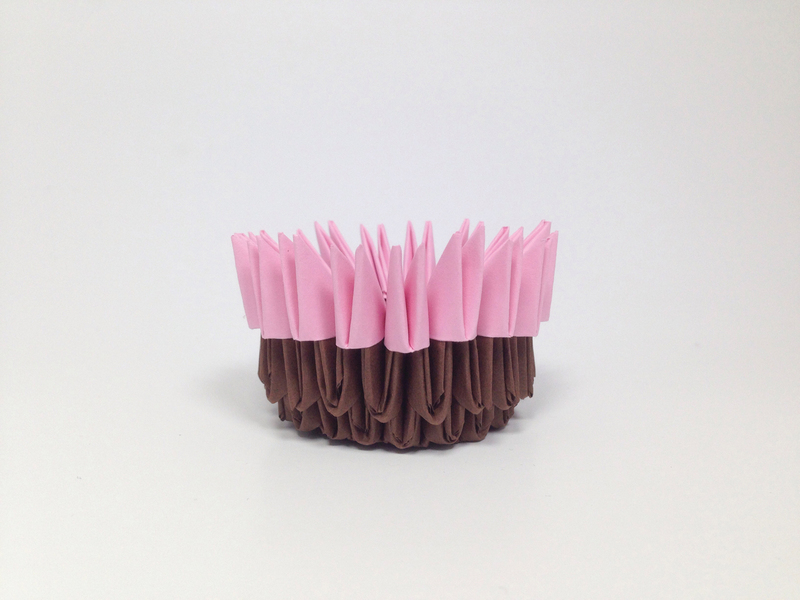 For the icing of the cupcake, there will be four full rows of pink pieces. When you’ve reached row 5, insert a pink piece in every other position. This will create a closing at the top of the cupcake. 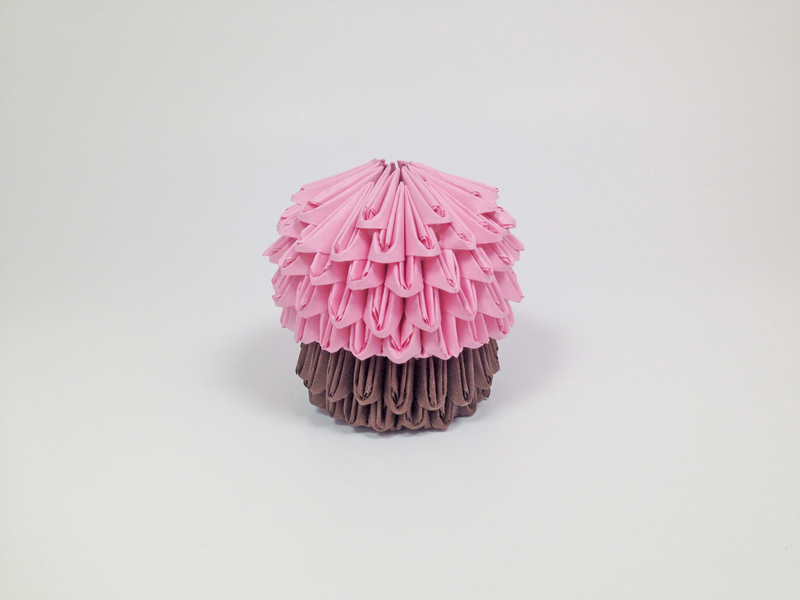 Use all-purpose glue to attach the red pom-pom to the top of your cupcake. 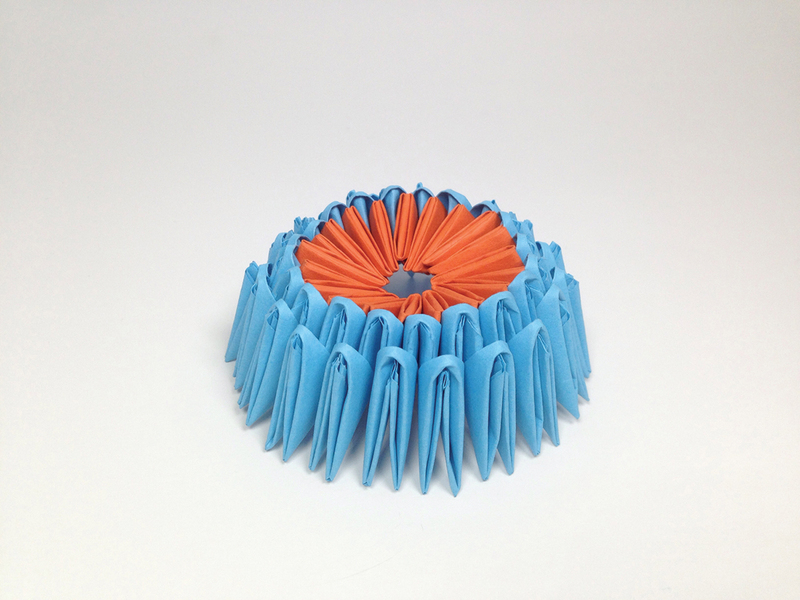 The ripples of the paper are very reminiscent of interesting frosting patterns.